21-Oct-2005 -- I was traveling to teach a course at the Mountain Studies Institute in Silverton, Colorado, and en route, hoped to visit 39 North 107 West in the process. As the course I was teaching focused on using geotechnologies, including Geographic Information System (GIS) and GPS, a confluence visit seemed like the perfect complement. I had long wanted to visit this confluence, for if successful, I would have an unbroken sting of 10 visits along 39 North from the canyonlands of the Colorado-Utah border at 109 West to the Kansas wheatfields at 100 West. No doubt a 10-degree wide string is not what propels the average person forward, but to me and other geographers, this was a golden opportunity. In addition, I would finally have an excuse to traverse Kebler Pass from Paonia to Crested Butte, not far from where I grew up in Grand Junction, Colorado. Kebler Pass proved to be a wonderful landscape of craggy buttes and aspens, with a few of the aspens defiantly displaying a brilliant yellow in the face of oncoming winter. At approximately 2pm, I arrived in Crested Butte and turned north past the ski area and through the ghost town of Gothic, Colorado. Confluence hunting always takes longer than I originally anticipate, and I was casting a wary eye on the setting sun as I drove down 100 meters of the Rustler Trail turnoff. I parked before the road submerged below the creek of the same name. It was 2:40pm, and I wasted no time in setting off, with a reading of 1.5 kilometers to the confluence. I knew it would be straight uphill, according to the map, but I made certain I crossed Rustler Gulch where the four-wheel drive road crossed it, to avoid any deep-canyon crossings. Upon encountering the water, I found it about 30 meters wide at the road crossing, so I struck out to the north and crossed on a series of convenient stepping-stones. A mass of willow bushes snagged me on the other side, but I kept to the north-northeast and was soon treading on Colorado high-country meadows and forests! After 10 minutes, I encountered a trail, which I took for awhile, but after finding that it led to the northwest, abandoned it and made a relatively straight-line course to the northeast. I realized that my backpack was hanging wide open, but fortunately found that my camera was still inside. I didn't think anything had fallen out (but read on, because something indeed had fallen out). I reached a four-wheel drive road, a sign for the Wilderness Area boundary, and a sign for Rustlers Trail, about 300 meters southwest of the confluence. The view was truly spectacular: I was staring at the back of the Maroon Bells, the front of which faced Aspen and Snowmass: the Elk Mountains. They were sporting the first autumn snows, and judging from the flattened grasses in the meadows I was traversing, snow had also fallen here in recent weeks. I hiked downhill to Rustlers Gulch and found a few stones to cross, which I promptly fell off of, obtaining two wet feet in the process. On the other side, I climbed a steep embankment, hiked southeast across a meadow, and had arrived at the confluence site about 50 minutes after I had begun my hike. I realized that the confluence would lie about 30 meters south of the northern edge of this edge of forest, inside the tree cover. Because I knew it would be more difficult to obtain a zero-zero position here, I took some photographs at the edge of the meadow. To my amazement, not only was there a trail heading south into the forest here, but the confluence is actually on the trail, at the spot where two dead trees make a 90-degree angle on the ground. The trees point right to the confluence! The confluence lies on the northern side of a forest of lodgepole pine and Douglas Fir, on ground sloping slightly to the southwest. 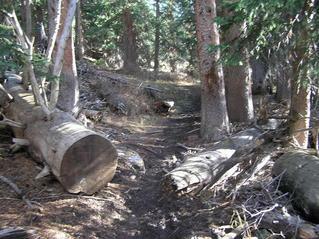 The confluence is located on the spot where the two fallen trees meet, and the trail meanders between them. I saw no wildlife during my hike, and few birds. No houses or any human-made structures are visible from the site. I did an extensive confluence dance but without much hope that I could zero out the GPS unit, taking some beautiful photographs in the process. It was getting late, and I had no flashlight. I was just about ready to give up when I was able to obtain a photograph of the zeroed-out GPS unit, just centimeters from one of the fallen trees! I was overdressed with my winter coat, but growing up in Colorado taught me always to be prepared. The thermometer on my GPS bag showed 14 C (58 F). After 30 minutes at the confluence site, I hiked out the way I came in. I had the idea of calling my spouse while at the confluence, but not surprisingly, there was no signal. In fact, I slipped on the slope at the precise moment when my cell phone said, "please say a command," to which I replied, "I'm falling!" I then reflected on my previous visits. Besides achieving my string of 10 visits along 39 North, this was my second visit to 107 West, having visited it earlier in the year in Wyoming. I hiked back to the four-wheel drive road and descended the mountain in the setting sun and beautiful surroundings. I decided to see if the road was the same one I had parked along, below. Sure enough, it was, and this proved a much easier hike than the way I had taken on the way to the confluence. Once back at the willows, I noticed my hat neatly snagged on one of the branches! I had not realized that it was missing, and finding it was quite fortunate: It was the one thing from the 1970s that I had not lost: A Grand Junction High School, Colorado, hat! I then found one glove, and held out little hope that I would find the other. I did not have time to retrace all of my steps back to the confluence, but only 100 meters away, I found the other glove. I chuckled all the way back to the vehicle, and departed for the Mountain Studies Institute. Total round trip hiking time came in at 1 hour and 50 minutes and was not as difficult as I suspected it would be. This was one of the most scenic confluences I have visited and it captures what people love about Colorado. #1: View of the confluence of 39 North 107 West, looking south. #2: Looking north from the confluence at the Elk Mountains. #3: View to the north from the confluence. #4: The confluence is 12 meters inside the forest at the far side of this meadow. #5: Ground cover at the confluence. #6: After nearly giving up, victory: Full zeroes on the GPS unit! #7: Joseph Kerski at the confluence site. #8: Rustler Gulch, 40 meters west of the confluence. #9: Wilderness sign about 300 meters south of the confluence, looking west. #10: Closest town to the confluence--Gothic, Colorado--actually a ghost town but the home of a biological research station. #11: 360-degree panoramic movie with sound filmed at the confluence (MPG format - right-click to save to disk).